My wife Juli and I have owned and operated Two Onion Farm since 2003, and farming has been our full-time occupation since 2005. We currently raise 1 acre of apples and 4 acres of mixed vegetables. All crops are certified organic. We primarily market our vegetables through a community-supported agriculture (CSA) program. We sell our apples through the CSA, to local grocery stores, and by processing them into Juli’s Organic brand of applesauce and apple butter. 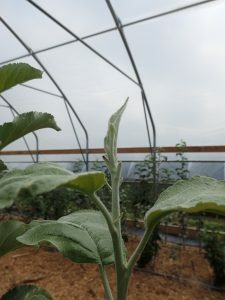 We planted our first apples in 2012 (prior to that we only raised vegetables); we have slowly expanded our orchard since then and we plan to continue planting more trees in coming years. We were motivated to increase our apple production by strong market demand for local organic apples, by our desire to protect our hillside soils from erosion with a perennial crop, and by personal interest in growing apples. 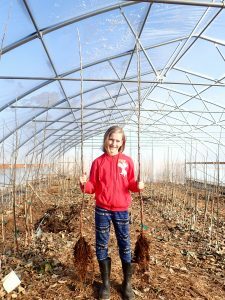 We have planted trees purchased from commercial nurseries and we have also grafted and raised our own trees in an on-farm nursery. 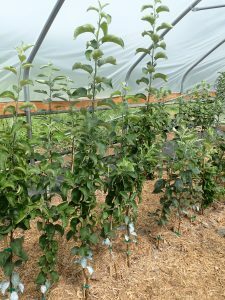 Our orchard is a high-density planting of dwarf trees; we raise primarily modern disease-resistant varieties which are well-suited to organic cultivation. We manage weed competition with regular mowing and bark mulch. We scout our orchard daily for pests, we monitor weather to predict pest outbreaks, and we only spray organic pesticides when required to prevent economic loss. Most commercial apple growers now raise closely-planted orchards of dwarf trees grown on trellises because these orchards are more profitable. In these orchards it is economically critical to plant highly branched (feathered) trees, which bear fruit more quickly and provide a faster return on investment. However, the only sources of feathered planting stock are commercial nurseries which raise non-organic apple trees with intensive pesticide use and spray synthetic growth hormones to promote branching. Although organic standards permit planting non-organic trees, we and many other organic growers in our region prefer to graft and raise our own trees organically to produce trees in a more ecologically sound way and to grow uncommon varieties which are well-suited to our orchards and markets but which are not available through commercial nurseries. We are able to raise healthy trees in our on-farm nursery using organic methods, but we have not produced well-feathered trees. In this project I evaluated two methods to promote branching in our organically managed on-farm nursery: manual leaf removal and sprays of a seaweed extract high in cytokinins. Manually removing young leaves near the growing point of the tree increased branching slightly, and spraying trees with a seaweed extract high in cytokinins reduced branching slightly. In addition, taller trees had more branches, there were strong differences between varieties in branching, and individual trees varied greatly in both height and branching. The cost in materials and labor for raising a tree in this system was approximately $11.95-$12.08, excluding overhead costs and costs of facilities and equipment; the different treatments to promote branching had minor effects on the overall cost of raising a tree. 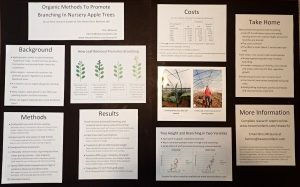 I shared results with other organic apple growers through a report on our website, an on-farm field day, emails to two grower list-serves, articles in two fruit growing publications, and a poster presented at the 2019 Organic Farming Conference in La Crosse, WI. Other growers participating in the outreach events expressed their frustration at being unable to produce feathered trees and their interest in the organic methods I trialed in this study. In an on-farm nursery of grafted apple trees, compare manual leaf removal and organic cytokinin sprays to an untreated control. For each treatment, record data on material cost and time required, tree growth, and feathering. Our entire farm is certified organic by MOSA (mosaorganic.org) and only organic methods were used in this research. We bench grafted 60 trees each of nine varieties (Pristine, Williams Pride, CrimsonCrisp, Ashmead’s Kernal, Golden Russet, Egremont Russet, Macoun, Grimes Golden, and Hudson’s Golden Gem) onto G.41 rootstock from March 24-31, 2018. We collected scionwood for Pristine, Williams Pride, and CrimsonCrisp from our own orchard; we purchased scionwood of the other varieties from Maple Valley Orchards (Suamico, WI); and we purchased rootstock from Cummins Nursery (Ithaca, NY). We held trees at 65⁰ for two weeks to promote callus formation and on April 13, 2018 we planted them in an unheated 34′x102′ high tunnel covered with a single layer of polyethylene. Prior to planting we applied 2 inches of finished compost (Purple Cow Organics SoilLife) over the soil surface in the entire tunnel. Because of unseasonably cold weather (outdoor daily high temperatures from 27-46°F and daily lows from 22-35°F), we covered the trees with frost cover fabric for one week after planting. After removing the frost cover we applied 4 inches of hardwood bark to the entire tunnel for weed control. Tree spacing was 10.75″ within row, 3′ or 8.5′ between rows. As trees grew, we thinned shoots to a single shoot per scion, we manually removed all branches below 22” above the graft union, and we fastened leaders to a bamboo stake. We irrigated trees as needed with drip tape throughout the season. We ventilated the tunnel by raising rollup sides and opening end wall doors except during severe storms and cold spring weather. We scouted trees regularly for pest issues. We applied several sprays with a backpack sprayer to control pest infestations: on 7/9, 7/16, 7/24, 8/2, and 8/10 we sprayed Pyganic EC 1.4 II (1/4 cup/gallon spray) to control potato leafhopper, Japanese beetle, and various caterpillars; and on 8/21, 8/29, and 9/5 we sprayed JMS Stylet Oil (1/4 cup/gallon spray) to control spider mites. We planted trees in a randomized complete block design, with four blocks, and 27 plots per block; each plot had five trees of the same variety to which one of three treatments was applied: (1) untreated control; (2) manual leaf removal – tear off 3 young developing leaves near growing tip three times, two weeks apart, starting when leader reached 22” above graft union; (3) spray Sea Crop 16 three times, two weeks apart, starting when leader reached 22” above graft union, at maximum label rate (2 cups/gallon water) to 8-10” at the top of tree. (Sea Crop 16 is an OMRI-listed plant growth regulator produced by North American Kelp, Waldoboro, ME. We selected it because it had the highest cytokinin concentration of any organically-approved plant growth regulator which we are aware of. Note that this maximum label rate of Sea Crop 16 results in 50 ppm cytokinin, which is only 10-20% of the concentration of cytokinin which is typically used when Maxcel is sprayed to promote branching in conventional nurseries). At the end of the season we collected data on the height of each tree above graft union, the height of lowest branch above the graft union, the number of branches, and the length of all branches. Graft success (measured as percent of grafts which had a live scion at the end of the growing season) was mixed. It was only 3% for Egremont Russet, presumably due to poor quality of purchased scionwood for this variety. Other varieties ranged from 60%-98%. Purchased scionwood generally performed less well than scionwood collected from our orchard. On several grafts, scions began growth in spring but then flagged and died during extremely hot weather in June. This was particularly true in the center of the tunnel (presumably the hottest area). The appendix at the end of the report contains scatterplots which show the actual number of feathers >4″ long and leader height for each successful graft in the study. Previously published guidelines state that feathers at least 4” long are desirable in the tall spindle system. We performed multivariate regressions to examine the simultaneous effects of tree height, variety, treatment, and block on several different response variables. There was a strong, statistically significant (p<0.05) correlation between height of tree and number of feathers >4” in length. Taller trees had more feathers. After accounting for differences due to variety and treatment, each increase in tree height by 6” resulted in one more feather >4” in length. There was a strong, statistically significant (p<0.05) effect of variety on number of feathers>4” in length. After adjusting for effects of tree height and treatment, Macoun had the fewest branches; then Hudson’s Golden Gem, Pristine, Grimes Golden, Williams Pride, Ashmead’s Kernal, Golden Russet, and CrimsonCrisp. CrimsonCrisp trees had 5 more feathers>4” in length than Macoun after accounting for effects of other variables. There was a statistically significant (p<0.05) effect of treatment on number of feathers>4” in length. Leaf removal promoted branching, and the Sea Crop 16 spray actually reduced branching. After adjusting for effects of other variables, leaf removal increased the number of feathers>4” in length by 0.9, and spraying decreased the number by 0.7. So the magnitude of the effect was relatively small. Analyses of the number of feathers>1” in length showed similar trends to the analysis of feathers>4” in length. There was no significant effect of treatment on average feather length, although there were effects of tree height (taller trees had longer feathers) and variety (Ashmead’s Kernal and Pristine had significantly shorter feathers than other varieties). There was no significant effect of treatment on the height of the first feather, although there were effects of tree height (taller trees have lower branches) and variety. There was a wide variation in tree growth above the graft union, from 2.5’ to 8’. In general, grafts grew much more than is typical for outdoor nurseries in our experience. Treatment did not affect tree height, although variety did affect height. Pristine trees were tallest, followed by Macoun, Williams Pride, Golden Russet, CrimsonCrisp, Hudsons Golden Gem, Grimes Golden, and Ashmead’s Kernal. The tables below show costs and time required to raise nursery trees in this experiment. In general, the costs of applying the leaf removal and seaweed extract treatments were small relative to other costs of raising the trees. Much more time was required for grafting, planting, deleafing and digging the trees. Major materials costs were for rootstocks, mulch, and compost. We divided costs into those required for all grafts regardless of whether the graft was successful (e.g., purchasing rootstock, grafting) and those required only for successful grafts (e.g., spraying trees in summer, digging trees in autumn). With this division we could calculate the cost per successful graft based on treatment and grafting success rate (Table 5). Again, treatment has a small effect on cost ($0.13 per tree). Grafting success rate has a large effect on cost – with a success rate of 60%, the cost per final tree is almost $5 greater than with a success rate of 100%. Other growers may have different costs, particularly if their labor costs, cost of rootstocks, and growing methods differ. Our figures assume a labor cost of $20/hour. Also, note that the calculations here underestimate true costs because they exclude overhead costs and costs of facilities and equipment. Also our calculations only consider costs for materials used, whereas in reality growers must often purchase more than they need, and this factor is particularly important in small scale plantings. In addition, successful grafts varied greatly in size at the end of the season, and some were not truly large enough for planting in the orchard the following spring; the grower would need to discard those trees or raise them for another year in the nursery, thus incurring further costs. Table 5. Cost To Raise a Successfully Grafted Tree as Determined by Grafting Success Rate and Branch Promoting Treatment. Does not include overhead costs or costs of equipment and facilities (including high tunnel). Graft success rate was 72% in our research. We saw symptoms of iron chlorosis in May-June, possibly due to overwatering and slow evaporation from the soil under the bark mulch. Our soil is high in pH (~7.0), which also contributes to iron chlorosis. Trees outgrew this condition later in the summer. Almost none of the nursery trees set terminal buds on the leader (we have observed this in young trees grown outdoors as well). Vegetative growth continued until early-mid October. Failure to set terminal buds may be a significant problem in the following year because the young tree in the orchard will not have apical dominance and will behave as if it had been headed. Some nursery trees formed many short axillary branches along the leader which did not elongate beyond 1″ in length and therefore were not counted as branches in this study. When practicing leaf removal, be careful not to accidentally break off the growing tip by trying to remove overly small leaves. We learned to only remove leaves which are large enough to be clearly distinguishable. Although we don’t have specific data on this, it was evident that the first leaf removal treatment encouraged branch growth, but that subsequent leaf removal treatments often resulted in no branch development or branches which remained very short. Major pest problems were potato leafhoppers and spider mites. Both were controlled well by sprays (Pyganic for potato leafhopper, oil for spider mites). Other pests were Japanese Beetle and various caterpillars (including a number that we do not observe outdoors on apples). No disease was observed. 2 Email written summary of results to relevant apple grower email list-serves: Apple-Crop and Organic Tree Fruits. Apple-crop has over 500 participants; Organic Tree Fruits has over 350 participants. 2/19/2019 – Emailed written summary of results to relevant apple grower email list-serves: Apple-Crop and Organic Tree Fruits. Apple-crop has over 500 participants; Organic Tree Fruits has over 350 participants. 2/22-2/23/2019 – Presented poster summarizing results at the research forum at the Organic Farming Conference in La Crosse, WI. There were approximately 3000 attendees at the conference. A reporter from the Crawford County Independent in Gays Mills, WI interviewed me at the forum for a newspaper article. To promote branching in nursery trees, we recommend manual leaf removal because it increased branching slightly (by about 1 branch per tree) and is inexpensive to perform. We implemented this technique by removing the three smallest leaves from the growing tip of the tree three times during the summer, at two week intervals, beginning when the tree had grown 22″ above the graft union. Be careful not to remove the actual growing point while removing the leaves. We may further explore how to increase the effectiveness of this technique by removing leaves more often and/or at closer intervals. Taller trees had more feathers and are generally more desirable for planting, so we recommend measures to encourage vegetative growth and vigor (e.g., a high tunnel or other crop protection/season extension, fertile soil, weed control, irrigation, and control of vegetative pests). The cost of raising trees on-farm is considerable, and we recommend careful consideration of costs and benefits. In particular, grafting success rate can have a large effect on the cost of raising a nursery tree. Using our growing methods, the cost of raising a tree would range from about $9.00-$13.50 if grafting success rate ranged from 60% to 100%. It’s also important to control pests and provide good fertility and irrigation to ensure that trees reach optimum size for planting in a single growing season. A farmer and commercial apple grower from northern Minnesota: “Thanks Chris! A few years back I was trying to figure out how to do this.” This organic grower has raised several hundred apple trees on their farm in order to start a commercial orchard. However they struggled to find a method that allowed them raise branched trees in their nursery, and our research results will help them produce better branched trees as they raise more trees and expand their orchard.